"Extruders and Slab Rollers That WORK"
For more complete information and specifications about NorthStar products, click the logo to visit the NorthStar website. Every part of NorthStar slab rollers are designed and made by NorthStar for their intended purpose. There are no off-the-shelf parts from other manufacturers. Bodies and rollers are made of high-strength, cast aluminum alloy. They are rust-free and virtually maintenance-free. No heavy shims or boards. No chains, cables or cast-iron gears, either. Slabs can be rolled in either direction or reversed, and you can add or remove clay at any time while rolling your slabs. Making tapered slabs is quick, easy and precise. The only limits on the length of slabs are your space and canvas available. 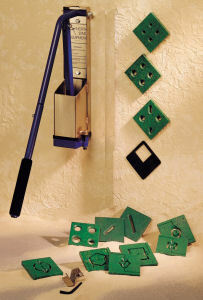 NorthStar extruders rank highly among the simplest and safest on the market for common small to medium extrusions. 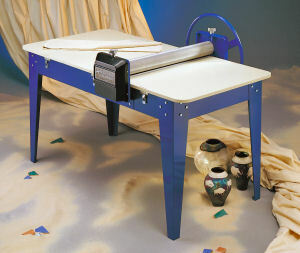 Proven track record of durability and utility over years of use in studios and schools across the country. 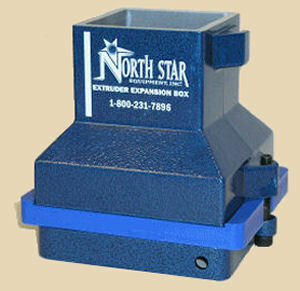 Both standard NorthStar extruders have 4" square steel barrels, tapered at the top for easy loading. Capacity is roughly 8 pounds. Handle length and barrel size are matched for plenty of leverage without ratcheting. Both standard NorthStar extruders come with 8 coil dies, 2 handle dies, one square coil, one hex coil, a blank die and a die mask. Several of the coil dies contain four cavities of different sizes and shapes. Use the die mask to block any three of them and extrude only the shape you want. Ever wished that your current extruder would let you work just a bit larger? The Expansion Box is an extruder accessory that enables you to go larger with your existing NorthStar extruder. The Expansion Box Kit includes the expansion box, die retainer ring and mounting bolts, hex wrench, three piece spacer board and lag bolts, and a sample die (the 6" bread tray). The Expansion Box Kit includes the expansion box, die retainer ring and mounting bolts, hex wrench, three piece spacer board and lag bolts, and a sample die (the 6" bread tray). Extruders with the Expansion Box and Big Blue extruders share the same dies. NorthStar's Big Blue Extruder stands alone: it doesn't look or work like any other extruder available today. With this extruder, there are no heavy bars or levers to lift up or pull down: just turn the wagon wheel handle to drive a compound rack-and-pinion gear inside the extruder. Only 30 pounds of force at the handle is plenty to make most extrusions! 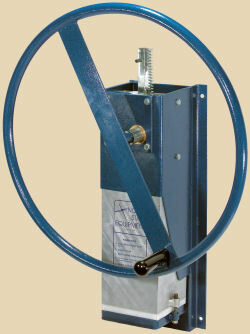 The barrel and die lift out as a unit for each cleaning, die changes, and loading. Barrel measures 6x6x12", so it holds a full 25 pound clay pug. Extrusions can measure up to 4-1/2 x 4-1/2 inches. The barrel is made of heavy-dut aircraft alloy aluminum. Housing is made of powder-coated steel and stainless steel. Die adapter available to use NorthStar's standard 4" dies in the Big Blue. 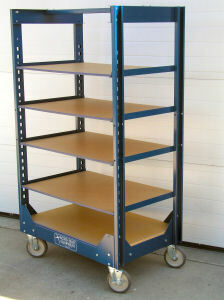 NorthStar shelf trucks and Versa-Cabs are moderately priced but built with industrial quality. Originally designed for potters, they are now used in print shops, machine shops, warehouses, factories and hospitals around the world. These trucks are wonderful additions to any studio or school. They will last a lifetime with almost no care required.